The 34-year-old man shot in the abdomen Friday at a protest outside the University of Washington appearance by Milo Yiannopoulos has improved to satisfactory condition, a hospital spokeswoman said. Susan Gregg, of Harborview Medical Center, said in a statement that the victim, identified as Josh Dukes, was transferred out of intensive care while his condition continued to improve. Dukes is a Seattle computer-security engineer and a member of the Industrial Workers of the World (IWW) General Defense Committee. 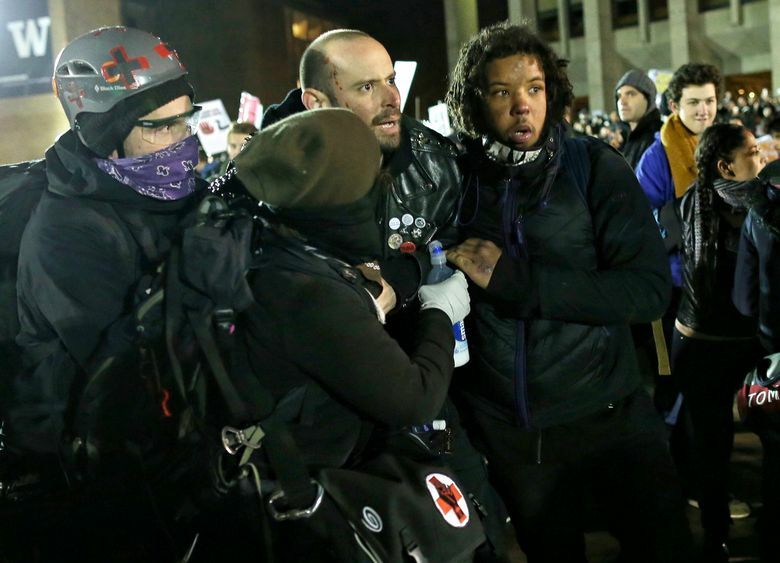 He was shot Friday night as protesters clashed outside Kane Hall on UW’s campus, where Yiannopoulos, a right-wing editor of Breitbart News, was giving a speech. The alleged shooter later turned himself in to police but was released after he claimed he had acted in self-defense. The Seattle Times is not naming the man because he has not been charged with a crime.